Vadhini By Nidhi Introduces Linen sarees which depicts royalty and classy look to carry in every and any event. Also we serve Pashmina Scarves for men and women which have different varieties to make your look unique. 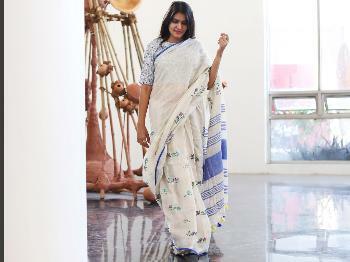 I came across a lot of designs in scarfs which we can wear in parties as well, And we kept sarees really simple and subtle. I'm Nidhi Agarwal, A Budding Designer in the fashion Industry. I started My venture "Vadhini By Nidhi" in Sept,2018. Also, I'm A fashion and lifestyle blogger "Treasuremuse", working in fashion industry since 2015. I thought of coming up with something classy which shows the elegance of ladies in the best way, So I launched my brand" Vadhini BY Nidhi". Shipping amount has to be borne by the client, The package will reach in minimum 2 days at metro cities. 7 days refund, if any manufacturing defect.